America is a nation of comfort foods. The bigger and heartier, the better. 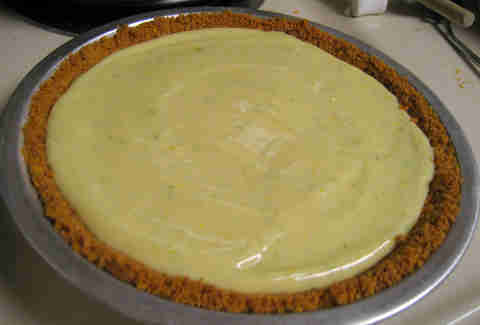 We've chronicled them for a while in our Fat Kid Friday pieces, but there's only so much you can do once a week. So, instead, we decided to look at them on a national level, and put together a (somewhat) definitive guide to each state's most popular comfort food staple. 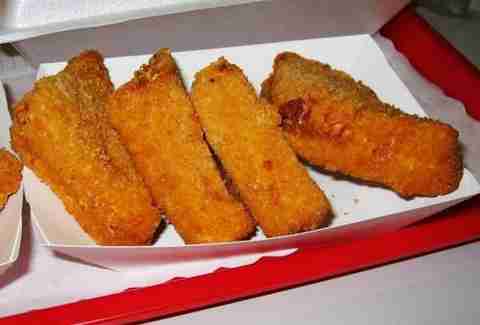 Prepare your eyes for an overload of golden-fried goodness. 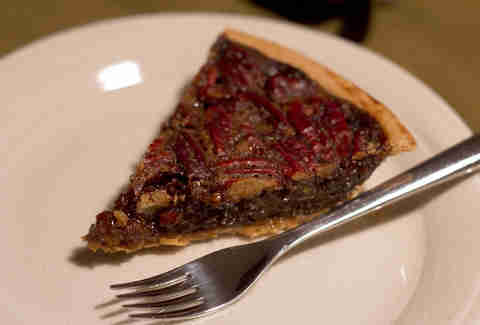 Legend has it that this butter- and brown sugar-filled treat was invented in-state back in the 1800s, and while it was probably actually birthed in Louisiana instead, there's no denying Alabamians' love for baking pies laden with the nuts that are grown in the South of the state. 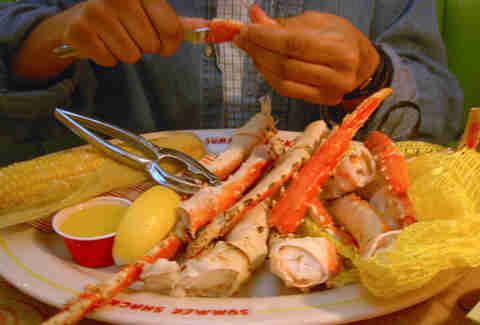 If your dad spent hours upon hours watching Deadliest Catch, chances are you know allllll about Alaska's king crab-fishing industry. And given how hard the dudes on that show work to get these things, they must taste all the better when it's finally time for them to sit down with their families. 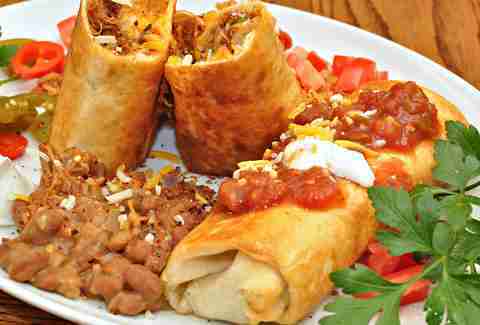 A burrito is already inarguably one of the kings of comfort food, but drop it in a deep fryer and its comfort level gets upped at least 9,000%. These things are all over Arizona, where they can be found cohabiting college students' stomachs with their life partner, Jägerbombs. 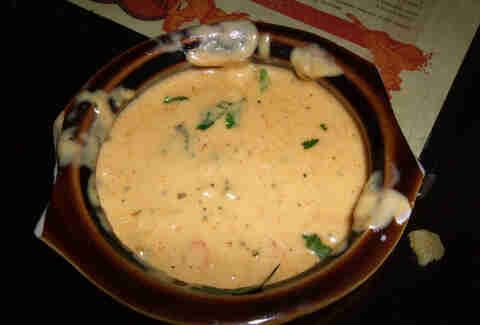 Texas stakes its claim to chili con queso as their Tex-Mex specialty, but cheese dip was actually first created in a small Mexican restaurant in Hot Springs, Arkansas way back in 1935 -- 10 years before Rotel, the key ingredient for the Texan recipe, hit shelves. Queso is easy to find in AR, but the state has even created a Cheese Dip Trail so people can dip their way through its many delicious variations. 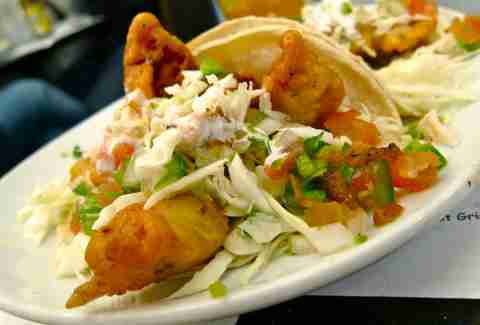 Plenty of foods could be the unofficial comfort food of California (Mission burritos, Animal Style things), but fish tacos win out for being the most all-over the state. From the boardwalks of Venice Beach to the boardwalks of Santa Cruz and other boardwalks beyond even those, fish tacos are a must for any traveler looking to rejuvenate themselves or for an opportunity to reference Rocket Power. What are two things Colorado has in abundance? 1) People waking up early to "hit the slopes" and 2) chronic cases of the munchies. 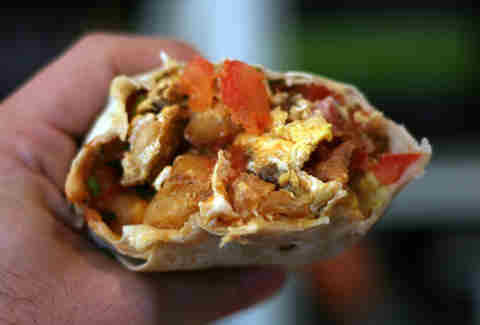 Combine those two, and you've got the breakfast burrito. Add in green chile, and you've got every meal in a Boulder resident's freezer. 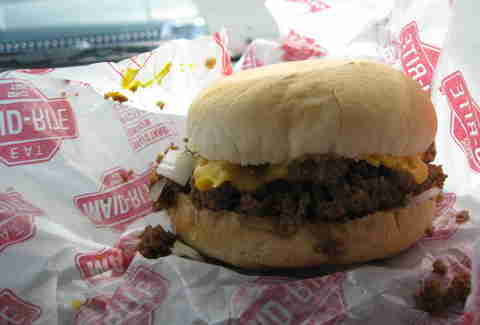 Unfortunately, Connecticut doesn't really have a ubiquitous comfort food staple (New Haven pizza was in the running, but it's not all over the state) -- but the hamburger was invented there, and Connecticut's most (in)famous variation thereof is the steamed burger. 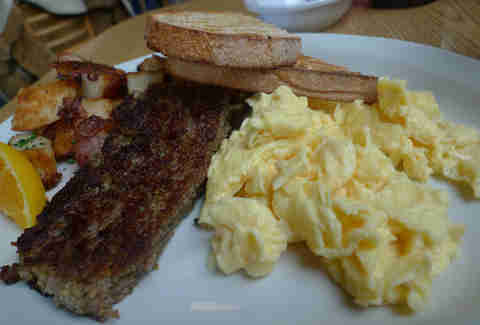 Love it or hate it, scrapple is here to stay -- the traditionally Pennsylvanian-Dutch fried mix of pork, cornmeal, and flour is also a staple of Delaware cuisine; so much so, that they have festivals dedicated to it every year. Ahhhh, the Sunshine State. Although the Miami contingent would argue that the Cuban sandwich is the option here, the rest of the state isn’t really representing that Latin flare, so the pick here is that creamy, graham cracker-y delight with those tart, tiny, aromatic citrus fruits found down where Hemingway and college Spring breakers drank a ton of rum. Georgia is famous for its peaches, despite the fact that Frank Underwood is doing everything he can to undermine their claim. Throw them in with some butter, cinnamon, and sugar, and you've got a comfort food that no amount of subversive shadiness can thwart. Consisting of white rice, hamburger patties, fried eggs, and brown gravy, the loco moco is pretty much all over Hawaii, from diners to plate-lunch spots. And the best part? You can eat it for any meal, due to its all-over-the-board ingredients. 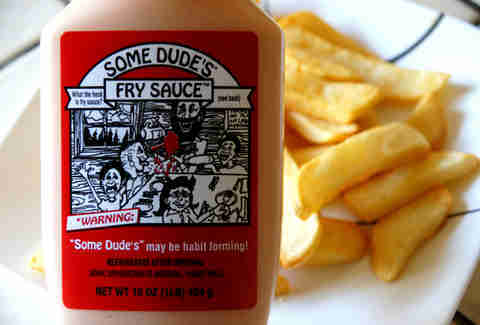 Sure, fries with fry sauce are also a Utah thing, but since Idaho's spuds are so popular, fry sauce (a combination of ketchup and mayo) is also one of Idaho's favorite condiments, and Utah has an even better comfort food staple (see below), so we're gonna give these to Idaho. You go, Idaho! 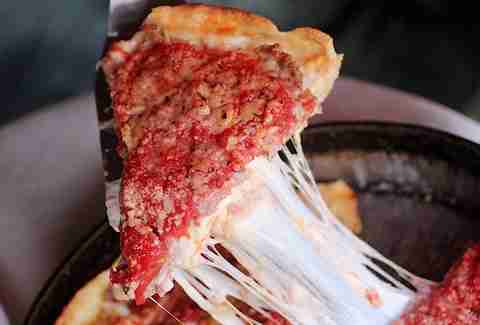 There are still some debates raging about whether or not Chicago deep-dish is actually pizza, or whether it's just a casserole, but it's undeniably a comfort food, given that one slice can feed a family of four. The concept of a wiener schnitzel, despite being as Teutonic as Arnold Schwarzenegger pounding back gugelhupf, is already a pretty American dish. 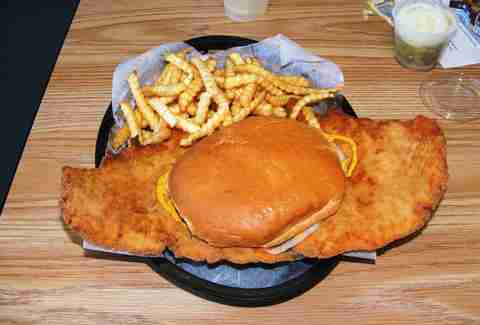 But deep-fry it rather than shallow-frying, and sandwich it between two hamburger buns, and you've got a food that's guaranteed to satisfy even the most finicky of Indianan appetites. 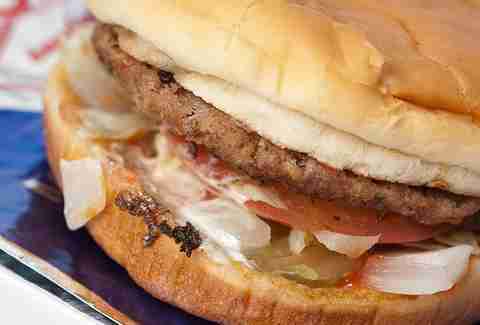 Also known as a tavern sandwich, loose meat is an Iowa staple that's basically an unformed burger patty between two buns. They were popularized by Iowa chain Maid-Rite, but can now be found all over the state -- and people's laps. 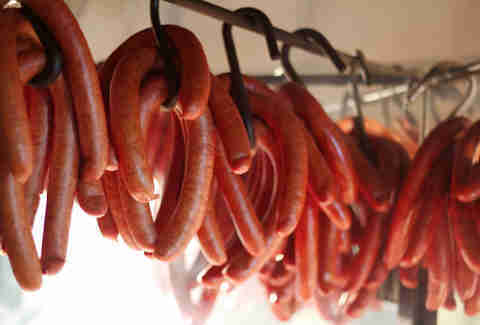 Eastern European immigrants flooded Kansas’s farming communities in the 1800s and 1900s and brought with them their recipes for traditional smoked sausages. Meat markets are loaded with more Czech bologna, Czech-style links -- made with beef, pork, garlic, salt, and pepper, and other smoked sausages than any Kansan could possibly load on their sausage breakfast biscuit. But they'll try, 'cause these are 200-year-old, well-tested recipes. 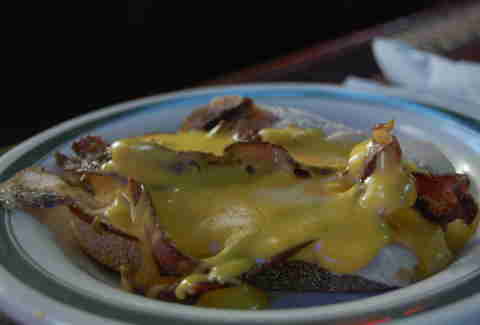 The Hot Brown, invented in Kentucky in 1926, is an open-faced sandwich with turkey, bacon, and Mornay sauce (cheese grated into Bechamel). 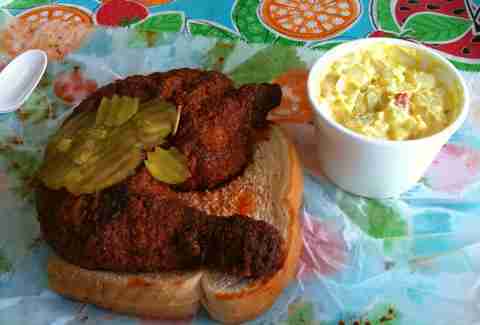 It's popular during Derby season, which, for Kentuckians, means it's one of the most important foods ever. 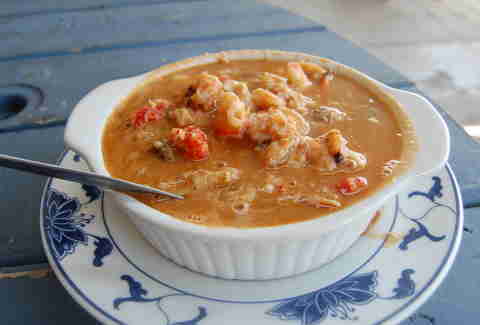 Louisiana gumbo comes in either Cajun or Creole varieties, but both are eaten with great relish (but no actual relish) all over the state. Which type you're getting depends on where you're located, and whether you prefer True Blood or True Detective. 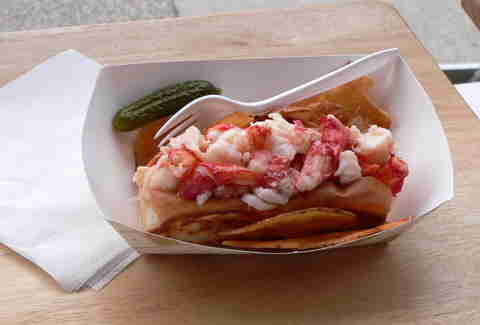 Connecticut also has a claim to this coastal New England delicacy, but the Maine variation is arguably better-known and is served cold and incorporates mayo, while the Connecticut variety is served warm with butter. Both are good. Maine's is just more famous. 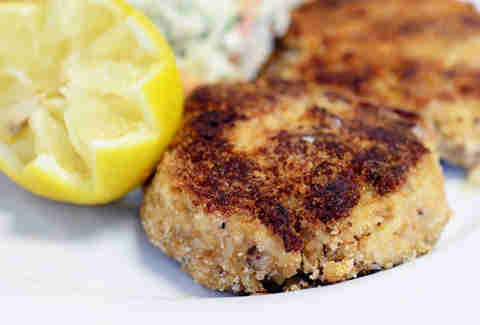 Even though the rest of the country has kinda appropriated crab cakes, Maryland still makes the best ones, owing to its location on Chesapeake Bay and its abundance of crabs. That is not a euphemism. Many Bay Staters might point you to the fluffernutter (a peanut butter & Marshmallow Fluff sandwich) as the state's definitive comfort food, and they might be right. 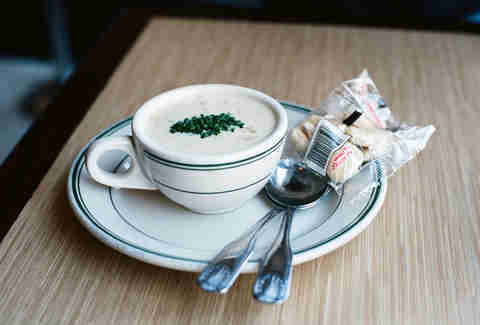 But a warm cup of thick New England clam chowder will do the trick more often than not, too. Notice I resisted the urge to say "chowdah". That's reverence right there. 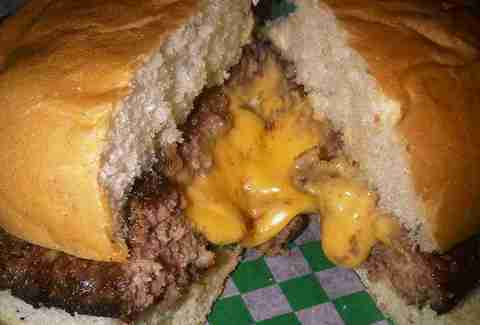 Or Jucy Lucy. You know something is a comfort food when it is the most American of cheeses stuffed into the most American of burgers and griddled up so that it comes out as the most American of oozing messes. And though Matt’s Bar spells it one way, and 5-8 Club another, it always kind of comes out the best. So-named because it resembles the thick mud surrounding the Mississippi River. 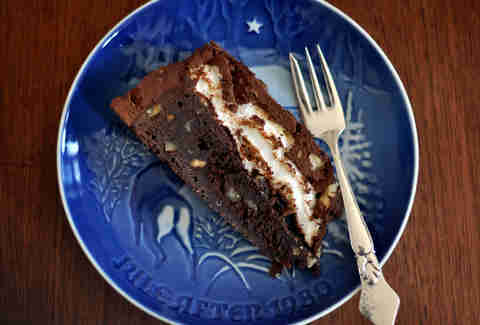 Only the mud is chocolate! THE MUD IS CHOCOLATE! 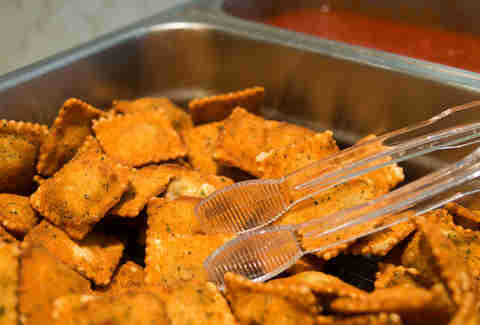 You could make salient arguments for Kansas City ribs and St. Louis-style pizza (covered in Provel), but it's the toasted ravioli that really tips the scale of public opinion in Missouri -- it was invented there, and there it remains a staple. History lesson: Back in the day, miners from Eastern Europe and and other places that love savory pastries would pack these things away before descending into the depths of the mines with their canaries and long facial hair. And though I normally associate pies with delicious fruits and holidays, I’ll make an exception for these hardworking gents and the popular Montana trend they started. King's Food Host, based out of Lincoln, created every kid's -- and adult's -- dream food back in the '60s: the Cheese Frenchee. The dream meal was an American grilled cheese, cut into triangles, coated in an egg wash and crushed corn flakes, and deep-fried. The chain is now-defunct, but the Frenchee is an oft-copied and constantly longed-for meal for the Midwest's Baby Boomers. Unfortunately, there aren't too many foods native to Nevada. 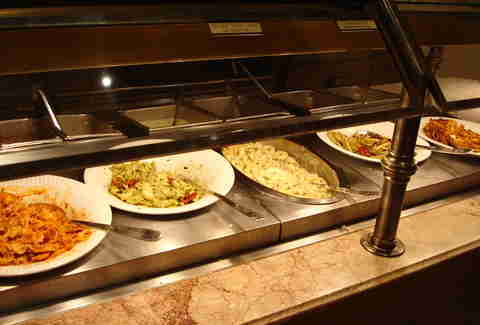 However, they do have some of the best buffets in the country, and plenty of folks willing to eat whatever's put on them in order to feel better about losing at that damn slot machine. New Hampshire is a difficult one, because it has a lot of the same things as the other New England states, but it isn’t as well-known for any of them. Sigh. 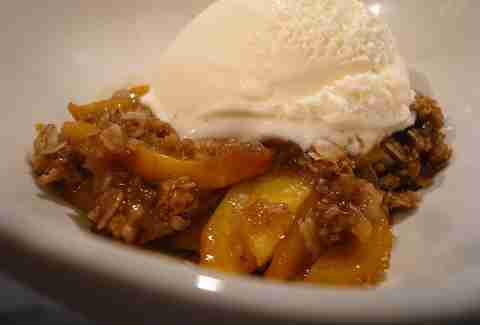 Anyway, stop being depressed, and start eating their apple crisp, since they have over 30 orchards where you can go pick up apples, then slice them up, cover them in sugar, cinnamon, oats, butter, and all those other things that make foods into actual recipes, and eat ‘em with a scoop of ice cream, likely from that state sitting above them. 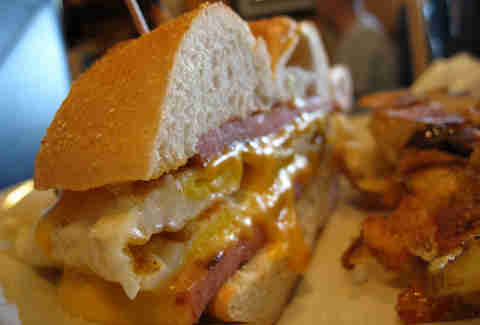 Everyone in New Jersey loves a pork roll, especially when it's an authentic Taylor ham one combined with eggs and cheese on a sandwich -- affectionately referred to as a "Jersey breakfast" in the state, and presumably followed by a GTL. The official state question of New Mexico is "red or green? 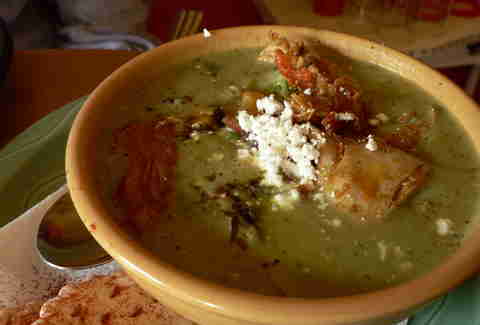 ", referring to the choice between red and green chile -- but you should opt for the green kind, because New Mexico does it especially well in stew. 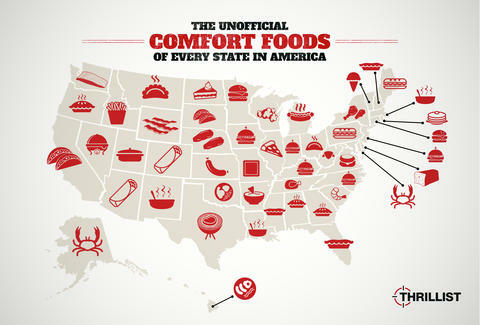 New York's got its fair share of significant comfort foods, but to represent an entire state? 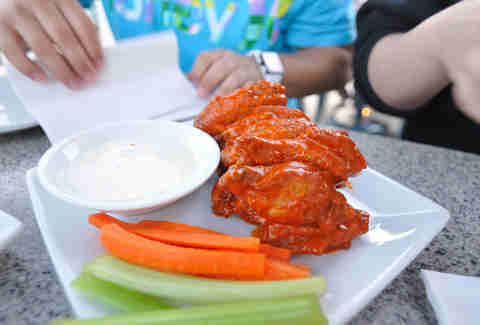 We had to go with Buffalo wings, the food that can be found in every bar from its eponymous city to the Big Apple itself. 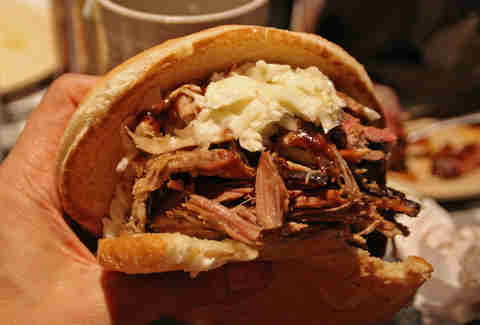 Carolina barbecue specializes in pork, and, while there may be a fight between Western and Eastern NC over sauce styles and chopped vs. pulled, it's never up for debate that the smoky, juicy BBQ is everyone's favorite sandwich. How you sauce it is up to you, though. 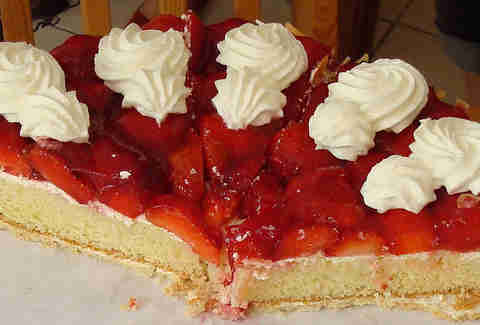 Despite being the "state dessert" of neighboring South Dakota, kuchen (a type of German cake) is just as popular in the North, owing to the state's German roots. It's also the basis of a popular Dakotan pick-up line: "What's kuchen, good-luchen?" Ohio’s got more Poles than a flag factory, and while regional dishes like Cincinnati chili, Columbus’s Johnny Marzetti, and Cleveland’s Polish Boy are amazing, the pierogi is omnipresent. 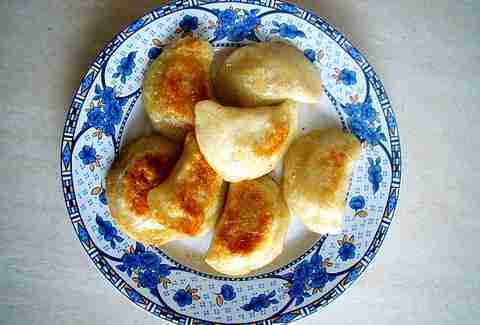 The Polish dumplings can be found in restaurants, markets, carts, and even sandwiches throughout the Buckeye State. Hell, they’re probably more common than actual buckeyes. Which is a tree, and not nearly as delicious as a potato and/or meat-stuffed Polish dumpling. But the Pierogi State isn’t nearly as catchy. 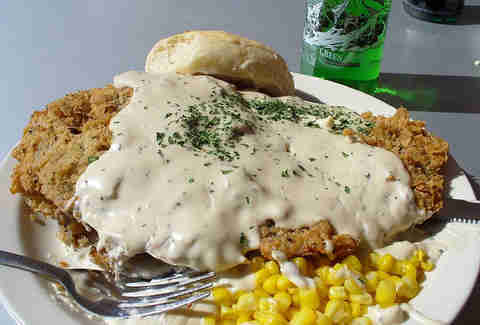 Oklahoma is the only state to have a "state meal", of which chicken-fried steak is the most prominent feature. Said meal also includes barbecued pork, sausages & gravy, fried okra, squash, and grits... so yeah, Oklahomans know what's up. While most of the country associates marionberry with a certain former DC mayor who had a thing for crack, in Oregon, the word means Summer. 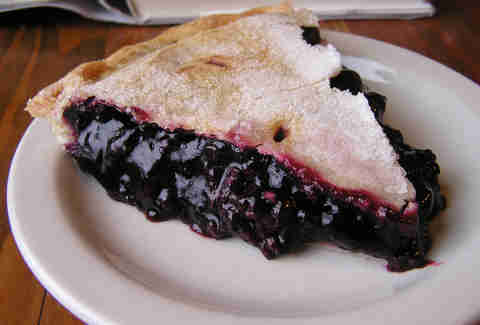 The tart, sweet blackberry -- which was originally cultivated at OSU -- makes the perfect Summer pie. That pie is ideally topped with a scoop of marionberry ice cream. Seriously. These things are like crack. 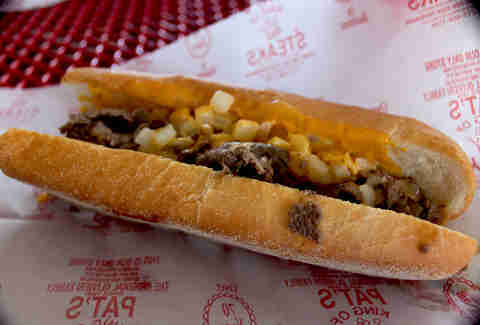 One of the hardest choices most Philadelphians make is which cheesesteak joint to go to on a daily basis, and for that they are the envy of the rest of the country. Forget frozen lemonade, grilled pizza, and everything else you think you know about the state that calls water fountains bubblers and has a very large mall in the middle of Providence. 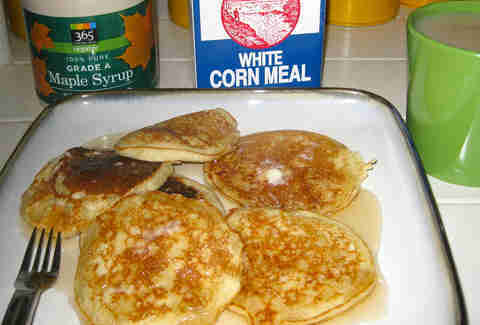 The real delicious move is to get these takes on pancakes, that use cornmeal and are smothered in delicious syrup and butter and all of those other glorious, fattening, American breakfast condiments. 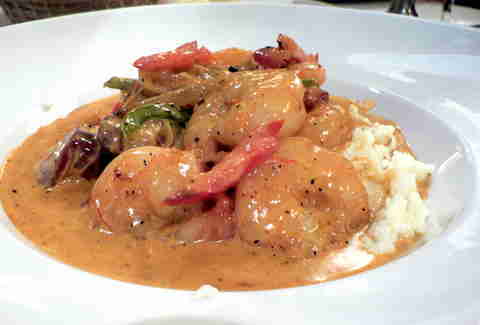 Grits are already the unofficial comfort food staple of the entire South, but add in some South Carolina shrimp and you've got a regional dish any Low Country native can be proud of. 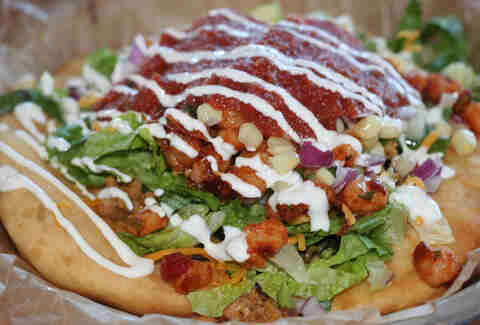 Frybread tacos, popular all over gas stations and restaurants in South Dakota, are essentially the same as normal tacos, except they're made with Navajo frybread instead of the traditional tortilla, owing to the region's strong Native American heritage. Fried chicken? Check. Extra spicy? Check. Necessitates the consumption of a sh*t-ton of bread afterwards and leaves you in a food coma for the rest of the day? Super check. Chicken-fried steak is undeniably a huge thing in Texas, but even bigger (besides, uh, everything) is BBQ brisket, which is the state's biggest contribution to our country's collective weight problem. 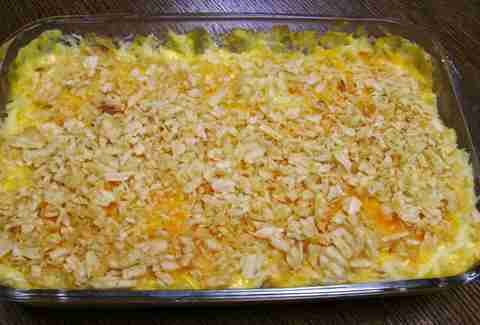 You've gotta get past the morbid name, but Utah's funeral potatoes are a well known comfort food (traditionally served at after-funeral dinners and other communal meals) that incorporates hash browns, cheese, onions, potato chips, cream soup, butter, and corn flakes. Yeah. 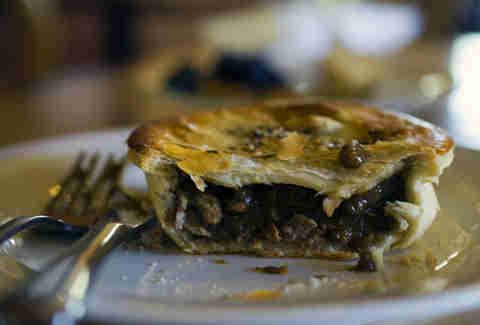 It may be the most comforting food on this entire list, if you're really into beige. 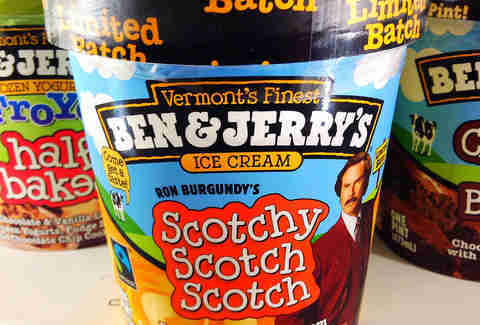 Though cheddar cheese is pretty comfort-y, nothing says, “I’m only going to wear pajamas for the next 48 hours and watch Designing Women reruns” like a pint of Chubby Hubby, or some equally amazing/depraved flavor from VT’s most beloved hippie sons. Sure, it’s the birthplace of George Washington and all, but let’s be honest: Virginia’s greatest contribution to American society is its ultra-salty, damn-near-perfect ham. 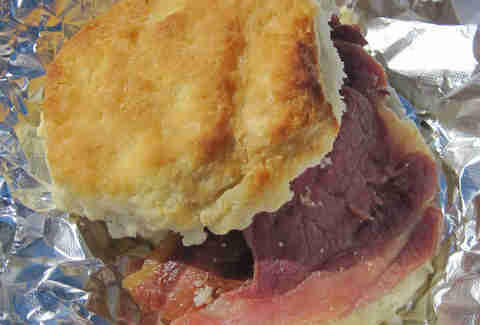 It’s so good, in fact, that it’s best enjoyed on a simple biscuit. Maybe with a little mustard, or a lot of butter. 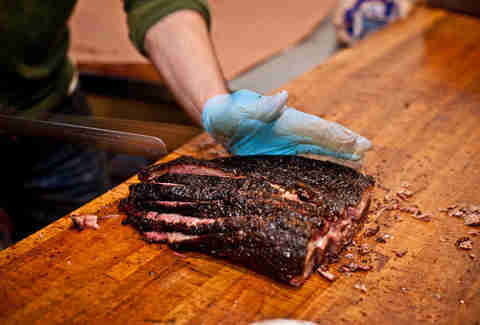 But anything else would mask the wonders of perhaps America’s best cured pig. 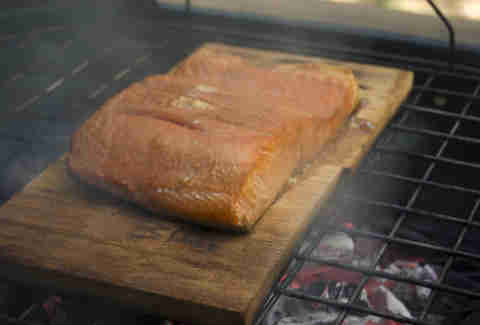 Salmon is the staple of the entire Pacific Northwest, but no state does it better than Washington, where it's smoked and served on their signature cedarwood planks. 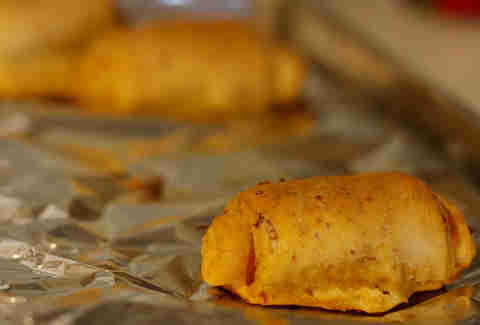 You can find pepperoni rolls at almost every corner and convenience store in West Virginia -- it's a little like a stromboli, except it usually comes in full loaves sold in bags. They can even be found in some MREs to remind West Virginian soldiers of home. While the brat may be the most ubiquitous and famed of Wisconsin foodstuffs, we can't quite classify it as a comfort food; brats are for standing next to a truck tailgate in parking lots, which are not that comfortable. 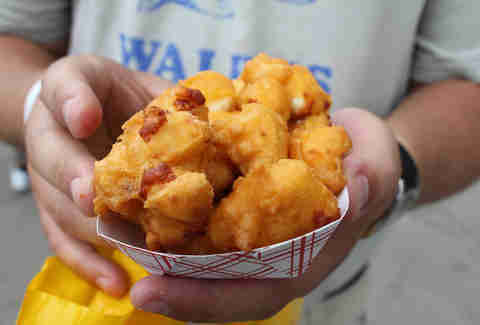 But fried cheese curds -- the notoriously squeaky cheese byproducts that've been breaded and flashed, and often get dipped in frighteningly creamy ranch -- seem systematically designed for the end of long days, following break-ups, and whenever else you just need things to feel like home. Nobody makes you eat broccoli rabe at home in Wisconsin. In cattle country, beef is everywhere. And in a wide-open range where your closest neighbor might be 30-miles up a mountain road, preservation of precious meat is key. 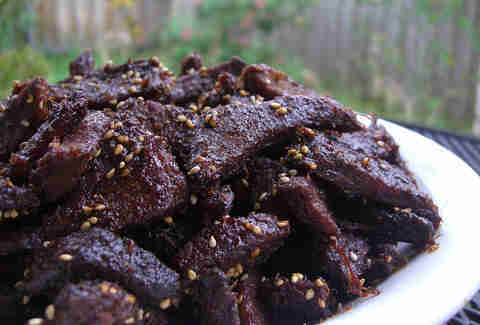 Beef and buffalo jerky is available in every general store, gas station, restaurant counter, and roadside shack from Cheyenne to Sheridan. And if you’re making that drive, you’d best stock up, since your options are going to be pretty limited in between. Adam Lapetina is a food/drink staff writer, and will still take a nice Massachusetts Fluffernutter over anything, any day. Read his musings on Twitter at @adamlapetina.